"Barack Obama", "Barbara Boxer", "CA-Sen", "Carly Fiorina", "Decision 2010", "GOTV", "poll"
Carly I-know-how-to-create-jobs-in-China Fiorina has been blanketing the airwaves with attacks on Sen. Barbara Boxer lately, but it seems the more she tries to tell Californians how much she hates Boxer's progressive record, the more voters get turned away from her. In devastating news for Ms. FCINO, a new California Field poll released today, just 4 days to go till election day, has Barbara Boxer with an all-but-insurmountable lead of 8 points. 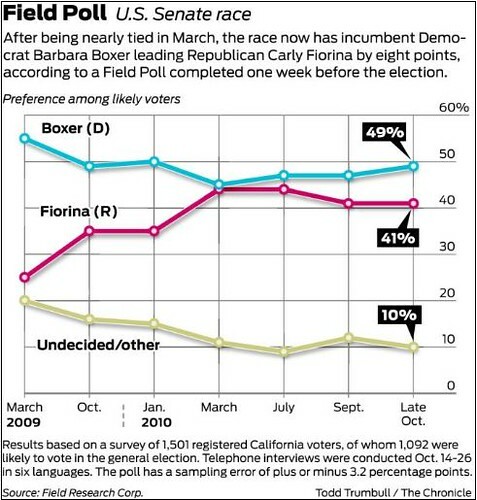 Boxer leads Fiorina 49-41. Digging a little bit into the numbers reveals something quite stunning: of the 10% "undecided/other," 6% are undecided and 4% have already decided on another candidate. This means that if this poll is right, even if every single undecided voter decided to vote for Fiorina on election day, Boxer would still win. And so much for the national meme of how proud, progressive standard bearers - at least this year - must win on a partisan vote, and cannot attract independent voters. Not so. Not in California. Not for Barbara Boxer. The Field Poll showed that both Senate candidates have a solid grip on their respective partisans. But the independents who make up 1 in 5 California voters and would always decide this race favor Boxer 49 to 32 percent. Why? Because voters can't stand Fiornia's extremist positions on abortion, immigration, and drill-baby-drill. Barbara Boxer is a national and long-time champion of women's medical privacy rights, including reproductive freedom, a proud environmentalist and the Chair of the Senate's Environment committee, and supports a humane, comprehensive immigration reform system with both strong borders and earned legalization. Boxer, of course, has hit Fiorina hard on those issues, and rightly branded her "too extreme for California." And all the money in the world doesn't seem to be getting Fiorina out of the hole she dug for herself. Barbara Boxer is proving yet another conventional wisdom of this year wrong. You know how they keep saying Democrats are running away from President Obama to try to win? Oh no! He's like a plague! And this isn't just coming from the media and the right of course. Plenty of detractors of the President on the ideological left have also staked out such a fallacy. Well, here's how the progressive conscience in the United States Senate responded to that. President Obama: And I'm optimistic because I know there are people like you out there, and I know there are people like Barabara Boxer in the Senate, who's fighting to change this country for the better. You have in Barbara Boxer a sub-compact Senator with a seemingly inexhaustible supply of energy. She's passionate about fighting for jobs. That's why we're embarking on clean energy reform to provide incentives for companies building wind turbines and solar panels and green jobs that can't be outsourced. That's what our future is about. And there are people all across this country who are dreaming about a better tomorrow. And then they're willing to fight for those dreams to come true. We're not only going to rescue our economy. We're not only going to rebuild it stornger than before, and make the American dream more secure for our children and our grandchildren. That's what Barbara Boxer is about, that's what you're about, and that's why I expect you to be out there making phone calls and knocking on doors and rallying the troops to make sure that you return Barbara Boxer to the United States Senate. Thank you very much California! Not only is Sen. Boxer's website features this video at the top, a shorter version of it is also running as a 30-second TV spot in California. Barbara Boxer is not running away from the President. She is standing tall and strong with President Obama and proud of the agenda that he has pursued for ordinary Americans. But the most devastating ad of the whole race might actually be this one. Former HP employees speaking out about Carly Fiorina's "leadership:"
Farrell (19 years at HP): I'm among 30,000 employees who used work for HP. Cheri (8 years at HP): I was supposed to retire there. Farrell: Carly Fiornia changed all that. Narrator: Fiorina laid off 30,000 people (citation: LA Times, 6/25/10). Teri (11 years at HP): And she shipped our jobs to China. Larry (10 years at HP): I had to pack my bags, and I was out the door that night. Teri: We even had to train our replacements. Cheri: She didn't need 5 corporate jets. Narrator: 100 million for herself. Larry: Fiorna never cared about our jobs. Not then, and not now. Boxer: I'm Barbara Boxer and I approve this message. I don't think it's any surprise that this poll comes out just as this spot and the Obama spot are running in California, and as the Democratic Party, along with OFA, is gearing up its get-out-the-vote (GOTV) efforts. This doesn't mean, of course, that this is a done deal. We have to close the deal, and make sure that not only does Sen. Boxer beat Fiorina, but that she wins with a progressive mandate. Remember that Fiorina still has a ton of money to pour into her campaign. Her campaign does not have to worry about money. But we need to keep matching her dollar for dollar every day until election day. Support Boxer now! Sep 1 Watch Barbara Boxer Wipe the Floor with Fiorina Tonight!